In August 1960, within a few days of the United Nations resolution authorising their participation, an Indian Air Force C-119G Packet landed at N'Djili airport in the Congo, bringing three crews and about 35 ground personnel from No 12 Squadron, Indian Air Force, to operate UN transport aircraft in that country. These young men were the pioneers of Indian Air Force (and indeed of Indian military) involvement in UN peace-keeping operations in Africa. Within the same UN mission, a year or so later, the scope of the IAF's involvement had grown to include the deployment of a larger detachment, this time of IAF aircraft as well as personnel: half a dozen English Electric Canberras, and their air and ground crews, from No 5 Squadron, Indian Air Force, flying in the interdictor role alongside Ethiopian and Swedish fighters. India's engagement, within 13 years of its own Independence, in the thankless task of supporting a particularly complex nation-building attempt, is surprisingly thinly-documented; particularly since it followed the death of the iconic Patrice Lumumba. But Indian involvement in UN missions in Africa has continued, on and off, since then, and has included long deployments and demanding operations till very recently. This book is a first draft (it can only be a first draft) attempt to describe the first such UN mission undertaken by the Indian Air Force. That first mission concluded, technically, almost exactly fifty years ago, in October 1962. Some of its veterans are still with us, and their memories are still thankfully clear. This book is a compilation of their memories, and a tribute to their spirit. The idea behind this series is to fill a gap in the publicly-available documentation of Indian military exploits, equidistant between the short pieces that appear in popular and scholarly journals, exhaustive histories, and the coffee-table publications that have been emerging in recent years. All these have a place, in recording the rich history of the Indian armed forces. But it may not be unfair to say that there has not been a low-cost package, lightweight and accessible but accurate (at least as far as possible), on the lines of those available in many other countries. This series is a modest attempt to fill the gap, and help build a broader appreciation of Indian military history. There are a number of forthcoming titles in the pipeline, and in time it is hoped they will represent a useful addition to the body of published material on the subject. It is also hoped, importantly, to bring them out in Indian languages as well. We invite readers to be a part of this project. We intend to keep this series open to additions and corrections. Initial print runs are deliberately being kept short, in the hope that these books will prompt other veterans of the campaigns and the periods described, their families, and others with information, to come forward with their material and corrections. It is explicitly intended to incorporate such additional material in future editions. We invite your ideas and suggestions, and will be delighted to hear from writers with related topics they wish to write on. The series title Rakshak has been chosen for a specific purpose: to convey the essentially protective, nonaggressive ethos of the Indian martial tradition. To those who have studied the application of military force, that ethos represents one of the most admirable qualities of mature, confident armed forces and their personnel. 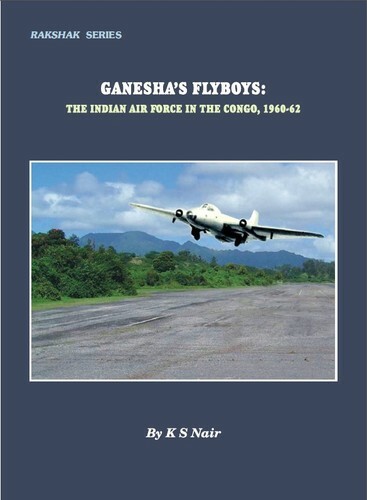 Click the button below to add the Ganesha's Flyboys : The Indian Air Force in Congo 1961 to your wish list.